Can We Use Base-8 and Base-12 Together? Although 10 Gigabit Ethernet is still marketing its way into the data centers, the need for faster data transfer rates is relentless, which means the migration to 40 Gigabit Ethernet is becoming inescapably compelling. For 40G Ethernet network, there are mainly two connectivity methods, one is Base-8, and the other is Base-12. Base-12 connectivity has had its place in the data center, while Base-8 is a new connectivity that could gain widespread acceptance in the next few years. With these two methods existing in 40G Ethernet network, there comes problems: Which one is more suitable for 40G network, or can we both use these two methods in 40G network? Read this articles, and you will get the detailed answers. Base-2 connectivity is the most commonly used one in the past, but as the data center grew to thousands of fiber ports engaged, stringing two-fiber patch cords across all corners of the data center will result in an unmanageable, and unreliable mess. So Base-12 connectivity is introduced. It is designed to develop a modular, high density, structured cabling system which could be deployed in data centers quickly, while also maximizing port densities within the rack space. In this connectivity method, all the fiber optic cables are based on an increment of 12 fiber, like 12-fiber or 24-fiber MTP trunk cable. Base-12 connectivity is common in data center, but here comes a problem when installed it in a parallel system. 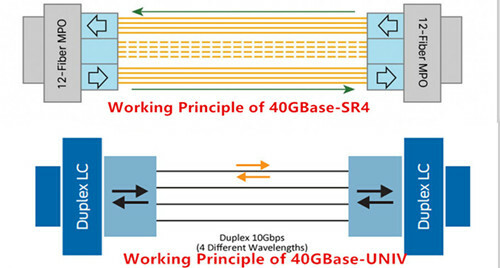 For example, if we need to use 40GBase-SR4 optics implemented in a 12-fiber infrastructure, four fibers for transmit, and four fibers for receive, leaving four fibers unused per connection, this will lead to a significant and costly loss in fiber network utilization. But Base-8 can be a more cost-effective option for end-to-end MPO to MPO channels and architectures. With 8-fiber infrastructure, the 40GBase-SR4 module will use all the 8 fibers. Base-8 connectivity makes use of fiber links in increment of 8 versus 12. The 12-fiber trunk cables are replaced with trunk cables in increment of 8: 8-fiber, 16-fiber, or 24-fiber trunk cables, etc. Although using Base-8 connectivity could decrease fiber consuming in supporting 40G data rates, in fact, in many cases, Base-8 connectivity isn’t a universal solution, and Base-12 may still be more cost-effective. So is it possible to have both Base-8 and Base-12 connectivity in the same data center? The answer could be “Yes” or “No”. It is never possible to directly mix the components of Base-8 and Base-12 connectivity, or plug a Base-8 trunk into a 12-fiber module. 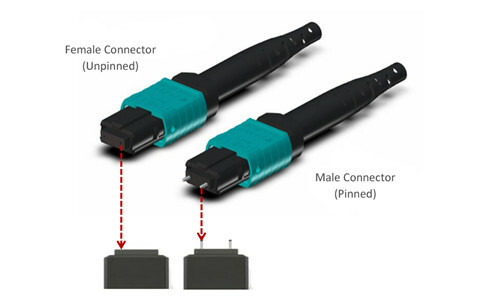 Because a Base-12 trunk cable normally has unpinned MTP connector on both ends, and requires the use of pinned 12-fiber breakout modules, while a Base-8 trunk cable is manufactured with pinned MTP connectors at both ends (pinned and unpinned MTP connectors are shown below). So if we plug a Base-8 trunk into a 12-fiber breakout module, just like trying to mate two pinned connectors together, this connection will definitely not work, and vice verse. It is possible to deploy both Base-8 and Base-12 connectivity within the same data center, just as long as the links are separate. Since Base-8 and Base-12 components are not interchangeable, during managing the data center physical layer infrastructure, we should do careful management and labeling practice to ensure we will not mix or mismatch them. Base-12 connectivity has dominated the 40G network market for years, while the Base-8 connectivity is an additional option in the network designer’s tool kit to ensure that data centers have the most cost-effective, future-proof network available. When using Base-8 and Base-12 in network, make sure that you need to carefully manage and label them, and that the components in Base-8 and Base-12 won’t be mixed.